Rosemary essential oil is derived from the flowering tops of the evergreen, shrubby herb found growing wild throughout Mediterranean countries, where it is believed to have originated. Known botanically as Rosmarinus officinalis and belonging to the Lamiaceae family, the upright form of this herb can reach a height of 1.8 metres, although there are other forms of the plant such as R. officinalis var. prostratus, which is a creeping variety that is often grown in rock gardens or for ground cover. The narrow fragrant leaves of rosemary are dark green on the upper surface, with undersides that are paler and matted with thick hair. During spring, the small and delicate, tubular, blue-white flowers begin to blossom on the tips of the leaves, and can remain in bloom throughout the summer. Because it grows under a diversity of ecological conditions there can be a great deal of variation in the colour and size of rosemary flowers, as well as the odour of its essential oil. Three principal chemotypes of rosemary oil are available in the essential oil market; 1,8 cineole, camphor-borneol and verbenone. 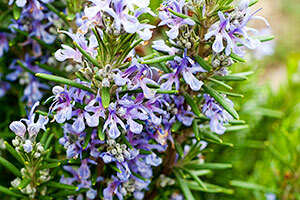 Rosemary has been used for its culinary, medicinal and magical properties since time immemorial. Bouquets of rosemary were found in Egyptian tombs dating as far back as the First Dynasty (c. 3100 BC), where it was used in incense for worshipping their deities. To the Romans who believed rosemary symbolised stability, rosemary was sacred and frequently used to decorate statues of their gods around the household. Rosemary has long been recognised as a symbol of remembrance. Not only was it reputed to strengthen the memory, but it also held special significance to lovers who used it in poppets (cloth dolls) to attract partners and brides would wear a crown of rosemary in wedding ceremonies. At funerals it would be placed on the coffin as a sign of remembrance and can still be seen in use today at funerals where mourners wear a sprig of rosemary. In ancient times rosemary was also considered an herb of protection. During the middle ages in England it was reputed to drive away nightmares if placed near the bed, and when planted around the house or hung outside the front door and windows it was believed to protect the home from thieves. During outbreaks of the plague, rosemary’s anti-infectious properties were captured in posies to carry whilst travelling, and the infamous “Vinegar of Four Thieves” potion which was used by grave robbers also contained it. Along with juniper berry, rosemary was burned in sick chambers and hospitals to protect against infection. In France, it became known as ‘Incensier’. Spain and Tunisia are the largest producers of rosemary essential oil, although considerable quantities are also produced in France, Italy, Morocco, Serbia and Montenegro. 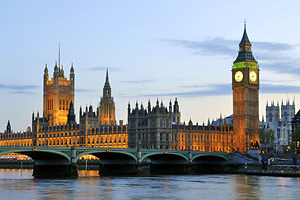 Recently in the United Kingdom there have been test crops grown to test the viability of producing essential oil. Tunisian rosemary essential oil is considered the finest by many connoisseurs, and although the Spanish oil is of good quality it is often adulterated to keep the price low and maintain its hold on the market, over which it has dominated for many years. 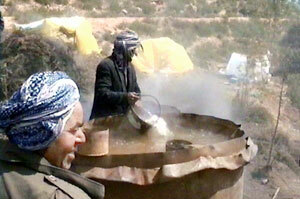 In Tunisia, harvesting takes place throughout April and May and often the herb is cut and collected by hand. The essential oil is often extracted on-site using crude field stills and expertise that produces an oil with a beautiful herbaceous aroma. 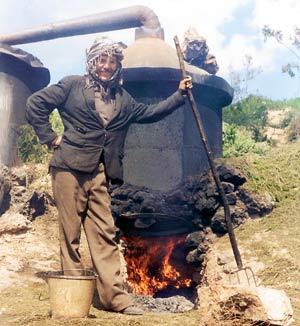 The pictures in the sidebar opposite show the harvesting and on-site distillation of rosemary essential oil on a mountain located in the Zaghouan forest in Tunisia. 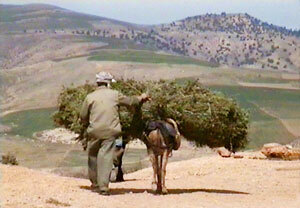 High up on the side of the mountain fresh herb is cut and baled by hand, loaded onto a surprising strong donkey and transported to the area where the still is situated. After carefully charging the still with rosemary leaves, the lengthy process of distillation can finally begin. The workers here labour continually throughout daylight hours under very difficult working conditions, often navigating perilously steep areas of the mountain-side. Certainly not recommended for the faint-hearted. Throughout the entire month that harvesting and distillation takes place, these workers practically live on the mountain, labouring around the clock and sleeping in small tents. Although the weather looks quite sunny, at high altitude in April it is actually very cold – especially when it rains as it did the day I was there. To work for an entire month under such miserable, and sometimes perilous conditions merits major respect. I nearly slid down the side of that blasted mountain on more than one occassion, and I was only there for the morning! Steam distillation of the flowering tops and leaves yields a pale straw or colourless essential oil with a unique fresh, herbaceous and slightly spicy aroma with woody, resinous and balsamic backnotes. 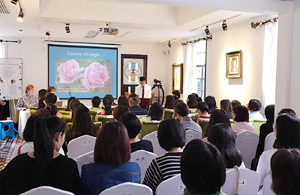 Although the equipment used in this particular enterprise is very primitive, the rosemary essential oil produced here is as good, if not better, than many I have sampled from ultra-modern distilleries. Further to its universally recognised efficacy when treating muscle, joint, circulatory and respiratory conditions, rosemary essential oil shows surprising versatility. It can be used to treat a wide range of other conditions such as arthritis, asthma, bronchitis, candida, catarrh, cellulite, colds, colitis, dandruff, hair loss, headache, hypotension, poor memory, muscular aches and pains, nervous exhaustion, neuralgia, rheumatism, sciatica, sinusitis, sprains, stress. Our ancestors believed that rosemary herb promoted youthfulness and used it as a preservative, and modern research has shown that rosemary essential oil does indeed exhibit potent anti-oxidant, antimicrobial and preservative properties which further increase its versatility. This has led to rosemary essential oil being used increasingly in skin care creams and lotions, and more recently as a natural preservative for food. The same invigorating and energising properties that rosemary oil brings to the body are delivered equally effectively on the emotional system. Inhaling its aroma can be like a ray of sunshine bringing hope and strength to those who have become disheartened and lost their self-worth, or lethargic and unable to deal with recent adversity. Rosemary really is a surprisingly versatile essential oil, . Rosemary blends very easily with most essential oils, and particularly well with basil, cedar atlas and virginian, frankincense, geranium, lavender, peppermint, petitgrain, pine needle, thyme, sage, sandalwood and all citrus and spice oils. 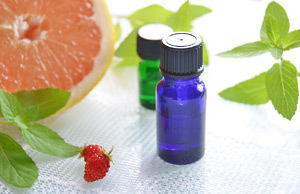 Due to the variable quantity of naturally-occurring camphor in this essential oil it is wise to avoid using it during pregnancy, or for those suffering from epilepsy or high blood-pressure. 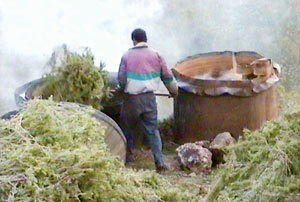 1) Transporting the baled rosemary down the mountainside to the still. 2) Charging the still with fresh rosemary leaves. 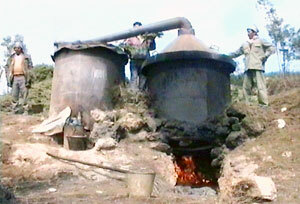 3) Worker rests and the process of distillation finally begins. 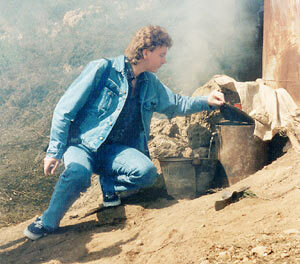 4) Geoff inspects the fragrant essential oil whilst trying to avoid sliding down the mountain! 5) Preparing to discharge the spent load. 6) Replace the water, charge more rosemary leaves, and the whole process starts all over again . . .